Actors Parvathy, Remya, make-up artiste and hair stylist Rehana, and a woman technician spoke to TNM about the systematic way in which they're being denied work. The Women in Cinema Collective (WCC) spearheaded the #MeToo movement in southern cinema a year before the wave that we're currently experiencing. 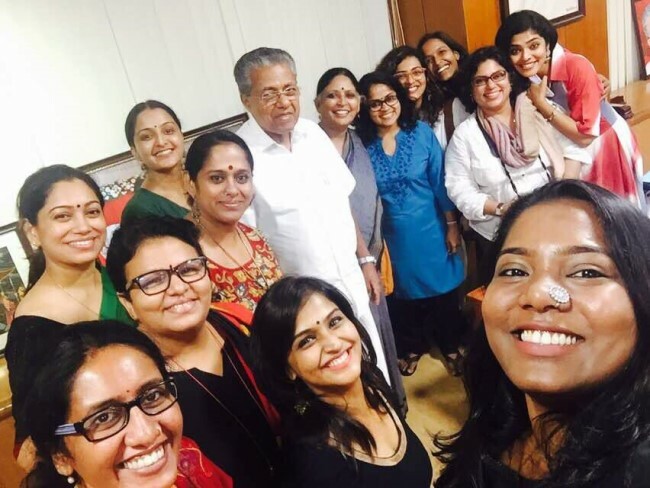 These brave women from the Malayalam film industry came together after their colleague was abducted and brutally assaulted in February 2017. Suddenly, Kerala society woke up to the fact that nothing could guarantee a woman her safety - neither money nor fame. Since then, the WCC has firmly stood by the survivor - battling the Malayalam film industry which is keen on protecting Dileep, the man who has been accused of masterminding the conspiracy behind the assault, taking on misogyny in cinema (including that of the superstars), and demanding processes to create a more safe and equal workspace. And for their efforts, they've faced increasing ostracism from the film fraternity. But is this hostile work environment especially new for women with an opinion? Speaking to TNM, Remya Nambeessan says that even before the WCC was formed, it was difficult for women who asked questions to get work in the industry. "I've been denied work for about four years now from the Malayalam industry because I've been speaking even before the WCC was formed," she says. "When we ask for the remuneration we deserve or if we ask for the script, they feel offended. These are things which I've experienced even before the WCC was there." 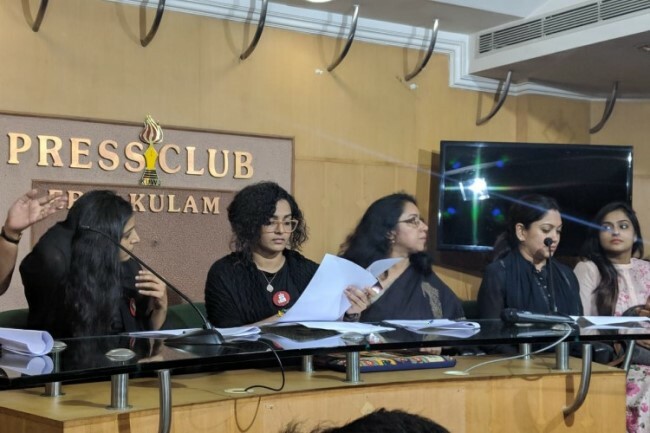 Remya says that the Association of Malayalam Movie Artistes (AMMA) has let down the survivor badly and that the WCC is only fighting against this. "People think we're a notorious group out to destroy cinema. I really don't understand this and it's quite unfortunate. We're here to restructure cinema, we want a safe workplace for all women - not just actors but also technicians. That clarity should be there," she says. Women actors in film industries across India have short shelf lives. While the male superstars act as the lead for decades together, women actors have a much more narrow window of 5-10 years. And if the women are the sort who brook no nonsense, their careers can be nipped even sooner. Actor Parvathy, who has delivered several hits in the recent past, says that apart from the projects she signed several months ago, she has only one offer in hand. "During Koode's shoot is when I spoke about Kasaba, and it unleashed this whole plethora of attacks. The movies for which I'm going to start shooting in November, were all films that came before Kasaba controversy or the very public conversations and discussions with AMMA that we've been having. Those are the only ones which are lined up for me. And then there's the one odd project that came from other languages. It's an English movie, an independent Canadian film based in Sri Lanka. That is yet to be finalised," she says. Parvathy says that despite the box-office success of her films, the "usual suspects", people who'd been interested in working with her previously, have stopped speaking about it. "Those calls are completely gone," she adds wryly. The only new project in the Malayalam film industry that she has signed is Aashiq Abu's Virus, a film inspired by real life stories on the Nipah outbreak in Kerala. But then, Aashiq Abu is married to actor Rima Kallingal, a WCC member, and the two of them have always been vocal about several social issues. "What I've come to understand is, most of the production houses, production controllers, are trying to alienate themselves as much as possible from the WCC. Because they think they'll pay the price for including is - be it production or distribution. For example, I've heard one of my directors saying that it's because I spoke up that the movie suffered," she says. The film that Parvathy is referring to is My Story, directed by Roshni Dinaker. The film faced a hate campaign online because of the Kasaba controversy and tanked at the box-office. However, it is to be noted that My Story received mostly poor reviews, while Koode (directed by Anjali Menon, also a WCC member), went on to become a big hit despite releasing only a week later and having the same cast members in the lead - Prithviraj and Parvathy. "When your own director, who is also the producer, says it's because she (Parvathy) spoke such things, it puts the thought in the mind of every other producer - that 'arey, I don't want to lose my money by taking this actor, I don't want to lose my money on someone who's getting dragged into controversies', which according to me is only the right thing to be doing. That's a very negative connotation put on the WCC members all the time and it will take a while for it to churn itself out," she says. Parvathy points out that Rima Kallingal started losing opportunities even before the WCC was formed because she would speak her mind about a number of things. "She has proved herself in every character that she has played - whether that's Nidra or 22 Female Kottayam - but her offers started dwindling. She has been openly criticising either the government or the film industry, the power structures, even before the WCC was formed," she says. Parvathy adds that it would have been amazing if the younger male stars, and the directors and technicians had stood with them because it's the right thing to do for the survivor. "I don't know what's scaring them. It's the elephant in the room. There's a reason that they're quiet. I know that it's not because they don't care - they are not that kind of people - but something is stopping them from speaking out and only a select few are paying the price for it. That's not fair," she says. Despite the pervasive hostile atmosphere, the WCC does have its supporters from the industry. Will they then prioritise including members from the Collective in their films? Parvathy believes the time has come for such an "inclusion rider". "I've not had a discussion with Aashiq on why he cast a certain actor for a role in Virus. But this film is replete with all of us who have been kept away in one way or the other. We've been cast because we suit the role but this (inclusion) is also in place," she notes. While actors are the visible faces of the industry, the battle is perhaps much harder for women technicians and others in the crew who have always been side-lined because of their gender. Make-up artiste and hair stylist Rehana has been out of work for a long time now. When TNM contacted her, she's on her way to attend a meeting called by the Hema Commission, which was set up by the Kerala government to look into the issues faced by women in the Malayalam film industry. "Yes, it's been 8-9 months since I got work. Everyone knows I'm part of the WCC. There's no doubt about it. People who oppose something, in any case, always face problems in the industry. For example, if the room facilities are not good or if there's inappropriate behaviour from someone, I've always reacted to it. They will ostracise us. Instead of coming out in support, they will create this image that you're a big trouble-maker," she says. Rehana says that like any other industry, there are sexual harassers in the Malayalam film industry too. However, though there are several good people, they do not extend their support to victims because of the power structures in place. "But there is no change in my stance despite the lack of work. I'm very firm on that. The time for women to speak and be heard has come," she asserts. Rehana says that though everyone in the industry knows about what happens behind the scenes - many of whom express their solidarity privately - none will speak up. "Except a few in the WCC, women who have a spine, nobody will say anything," she adds with a laugh. "But when we become stronger, there are more people who will join us." Rehana further says that a number of people have been calling her - not to offer work, but to ask if the WCC is planning to level any #MeToo allegations soon. "They're all afraid because they know we're not scared," she quips. "Now we're seeing people resigning over allegations of harassment. This fear is what we need. They should be afraid of harassing women. We have not got what we desired, but this is for the women who come after us." A technician who did not wish to be identified also told TNM that she has been denied work opportunities because she's part of the WCC. "A production house for which I worked in the past got in touch with me for a film. They said I have to be part of the project. The director said we'll pitch for the National Award and all kinds of things. He happens to be a friend. I went for the story narration too," she says. However, despite everything being nearly finalised, the project slowed down. When she persistently asked the director what had happened, she was told that the producer was backing out because the film involves WCC members. Other than the technician who spoke to TNM, the lead actor he'd cast is also a WCC member. "Then he told me that I should get producers for the film. The onus fell on me. It was ridiculous," she says. The project has been in a limbo since then. "Generally also, it's difficult to find work because of the groupism here. People work in cliques only. They won't let anybody else enter. I've faced it from the top level to the entry level people - and this is true especially in the technical side," she says. The technician says that there are many in the WCC who've been denied work opportunities and who are unable to put a project together because people won't back them. "It's a market mafia," she says. "The men and women in the industry, if they budge an inch from where they are now, they will lose out - and we're an example of that. So they will not open their mouth. You raise your voice, you are out." What all these women agree upon is this - there is no turning back and they have no regrets. They share the conviction that they're part of making history and that generations to come will reap the benefits of the seeds of revolution that they have sown.